“You can’t there from here, you better to take a taxi.” A young woman with dark curly hair and her mother were trying to dissuade me from walking one kilometer in the 35° heat. It was sweating weather, with the sun beating down, and maps are hard to come by for Ramallah, despite its being the second-most popular destination for visitors to the Palestinian Authority. But I was intent on finding the city’s latest attraction, a SpongeBob-themed restaurant modeled on the Krusty Krab restaurant on the iconic and much-adored children’s show on Nickelodeon. Al Ra’eesy Street, also known as Main Street, begins at Manarah Square, the site of the famous Stars and Bucks café that borrows liberally from the famous American brand. 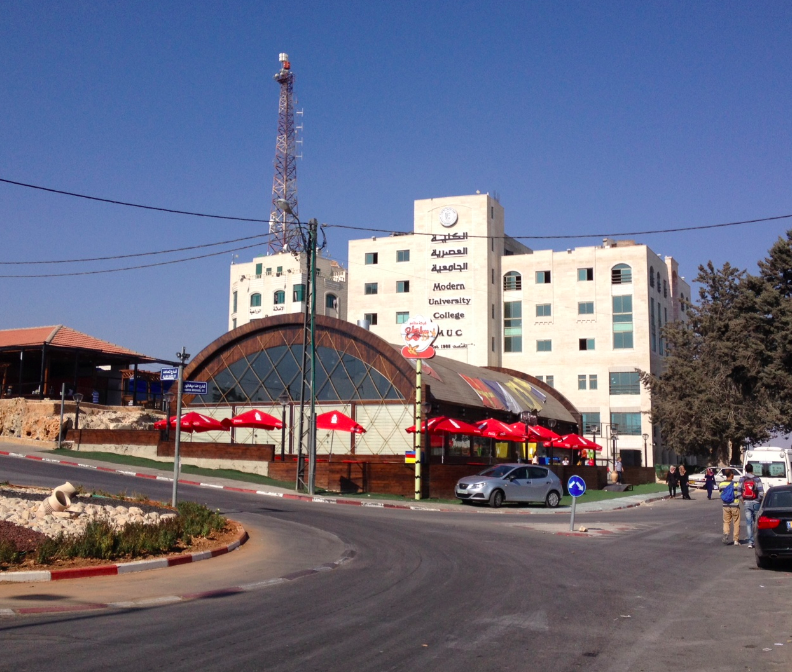 According to the Facebook page of Krusty Krab, the restaurant is located at 35 Al-Ma’ahed Street. People had suggested that I ask for the Maslahat al meyaah, or the water company, because people were apparently more familiar with that building than with the SpongeBob restaurant. The mapping feature on the iphone or Google maps is no help in finding the address, either. So, after getting lost at the Latin (Catholic) monastery’s graveyard, I was directed to the Arab Bank and a pharmacy nearby. A young man was arguing with the pharmacy owner over whether the shampoo was from Israel before buying it, reminding him that there has been a widespread Palestinian boycott of Israeli products since the war in Gaza. That wasn’t the only evidence of the recent war. Graffiti was everywhere, including paintings of M-35 rockets, one of Hamas’s oft-used missiles. Some graffiti were more self-critical or confusing. One showed a giant bird with a Palestinian flag committing suicide. “Okay, if you want to get there on foot and not by taxi, walk down this street until you reach a stoplight, take a left, and then your first right and then up to the traffic circle and another left and right. You’ll see the water company building. Okay?” said the woman, who spoke with a distinct American accent. My journey along Al-Sahl Street took me past the giant Greek-Catholic school, which dwarfs its 19th-century church. A 19th-century building hosts the Al-Nahda Women’s Association. A right on Khalil Sakakini Street took me past Edward Said Street, and I felt as if I were walking through Palestinian literary history. Despite the lack of a map, some of the streets did have helpful explanatory notes on them about whom they were named after. Finally, slightly dehydrated and tired, I trudged up a hill to find the Palestinian Legislative Council building and could see the water company and, in the distance, the distinct hangar-like structure of the SpongeBob restaurant. The restaurant seems to be officially called “Salta3 Burger”, the “3” being in place of the Arabic letter for ayin. In May, the owners created a Facebook page and posted pictures of the construction. Those familiar with the show will recall that the restaurant has a semi-cylindrical shape with the sign of a giant crab. It has flags hanging from the roof. On the show, SpongeBob is the cook at the restaurant, which is run by a greedy and hard-driving crab named Eugene Krabs. In designing the restaurant in Ramallah, the owners tried to keep the details the same, including the wooden paneling on the sides and the flags splayed across the roof. The counters at which one orders are shaped like open boats, as in the original. Tables are round with alternating red, yellow and blue colors like a giant target. A small table with a giant pleather-backed red chair has merchandise from the show available. 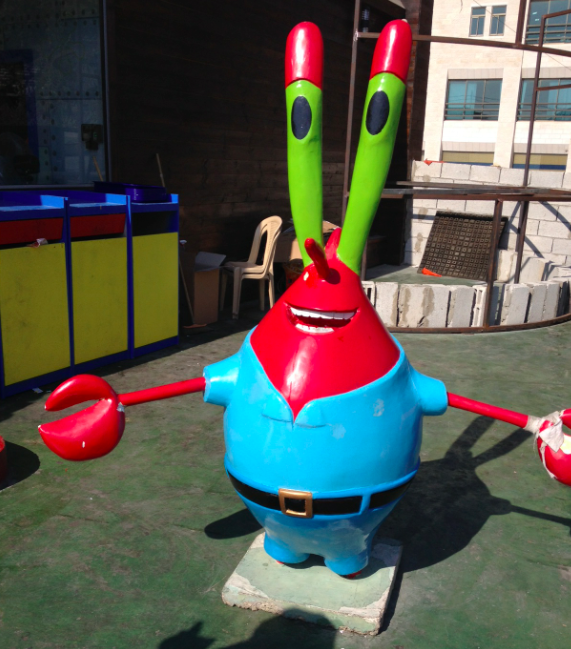 There are large plastic characters from the show, such as Squidward Tentacles, the raspyvoiced neighbor of SpongeBob, and a giant life-size figure of SpongeBob. The restaurant seems to still be a work in progress. The restaurant was opened in early August. When I visited it last week, it seemed that the only things available were hamburger or chicken burger meals. A larger menu was published online on September 4, featuring chicken wraps, a Greek salad, hot dogs and a dozen other items. The “Krabby patty” regular burger was tasty. One can have it with or without cheese. It comes with a side of fries, coleslaw and a soda for NIS 24.99. The chicken option was the same price. The fries were tasty and well spiced. The coleslaw was watery, and the chicken patty was tough and overcooked. But it’s fast food, so what can one expect? The restaurant seems to be a hit with kids. Dozens of them hovered around the giant plastic characters from the show, taking photos of each other on smartphones. Several families milled in and out. With some 25 tables, each seating seven on stools, there was ample space for many more customers. But the girls working the counter said the restaurant was doing well. It is open from noon to midnight. 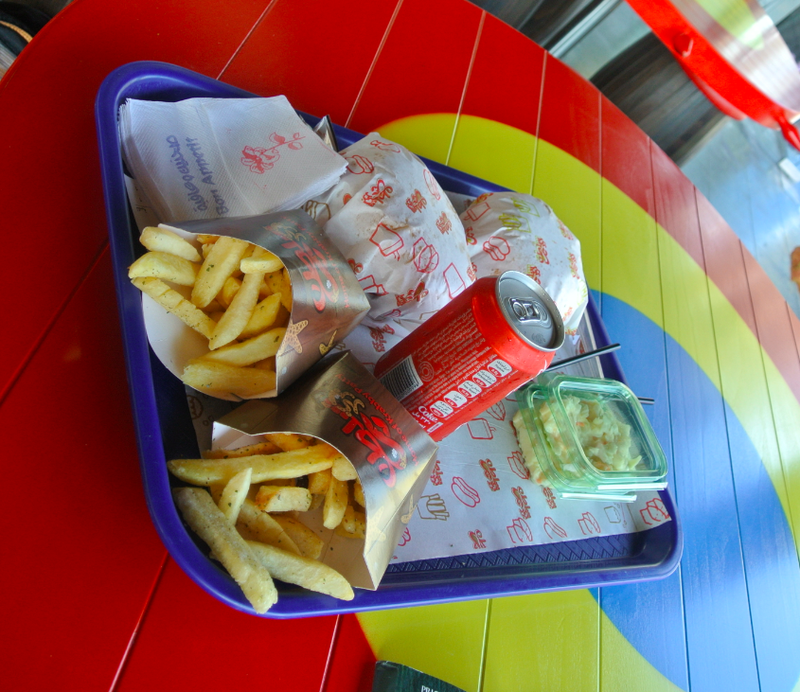 It boasts of being the world’s first Krusty Krab-themed restaurant. Narimeh Etmah, a co-owner, posted a video online where she explains her motivation for opening it. “We made this restaurant to give them something they don’t have: the sea and that environment Palestinians are missing,” she says. Nidaa Fsaisa-Soboh notes, “We have lack of seafood and lack of fish… except in Gaza, and we can’t enter Gaza.” The restaurant postponed a launch party for the restaurant due to the war in Gaza. “We are preparing our new menu, which will have shrimps and calamari,” says Etmah. The owners note they want to franchise or open more branches, including in Gaza. “They need this,” Etmah says on the video.